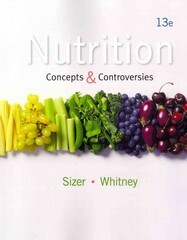 Nutrition 13 Edition Ideal for both non-majors and mixed-majors, NUTRITION: CONCEPTS AND CONTROVERSIES provides practical applications and accessible explanations to dispel common misconceptions about nutrition and empower readers to make lasting behavior changes. Do pregnant women really crave pickles and ice cream? Are carbohydrates good or bad? These and many more topics are explored in NUTRITION: CONCEPTS AND CONTROVERSIES. The Thirteenth Edition of this text dispels common misconceptions about nutrition, and equips you with a thorough understanding of important nutrition concepts and tools that empower you to make informed decisions about your own nutrition choices. Known for its clear explanations that show you how topics relate to your life, the text provides the basics of nutrition--from how to be a good consumer to understanding the science of nutrition--and is packed with interactive learning tools and study aids to help you in your course. Available with InfoTrac Student Collections gocengage.com/infotrac.